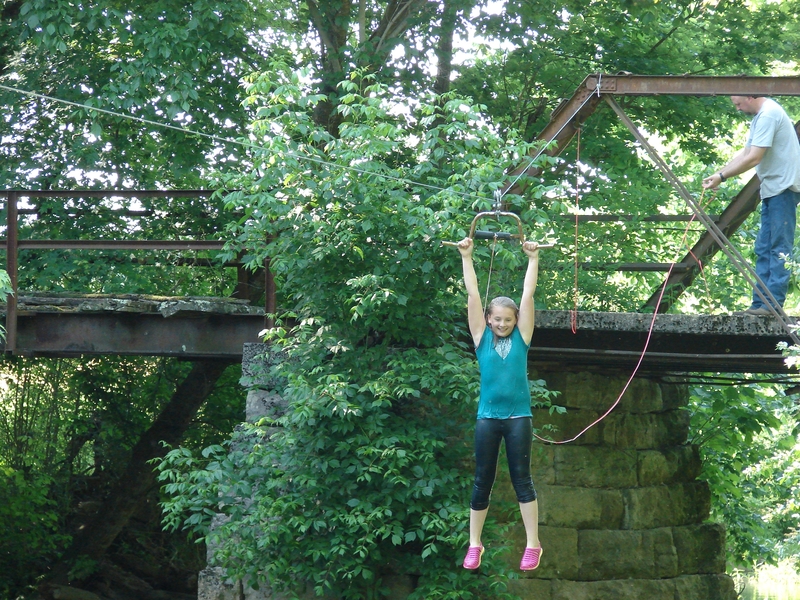 You may remember last year when I showed off our creekside clean-up and our new zip line. That was exciting stuff! You can read about it here if you missed it. Now I’m revisiting all that fun because swimming season is upon us. I want to share how you can have your own DIY zip line, as long as you have an awesome creek, lake or river to drop into, and an adventurous streak! I won’t pretend I had a lot to do with it, but I did get pictures of the whole process, and I have Coach handy to name all the gadgets and tools that you’ll need. We have the advantage of having an old, iron bridge on our property. This bridge got condemned somewhere around 1984-85, and a new bridge was constructed that changed the path of the traffic near my house. Our property became the last spot at the end of a dead-end road, and the bridge was given to my stepdad by the county. This bridge was erected in 1884 (after 100 years it deserved a break) and the end closest to our driveway, the end over the creek, is still sound as a pound. It’s the other end that we try to avoid. You don’t have to have an iron bridge to construct your own DIY zip line; a good, sturdy tree will work just as well. Since we do have one, we used the bridge as the anchor point, and the jumping off point. If you use a tree, you’ll need to build a platform with a ladder up, which I don’t know how to teach you…sorry! They secured the metal cable to the top rail of the bridge using two cable clamps. Brother Bear and Nephew Jordy made use of the peddle boat to pull the cable down the creek so they could secure the other end to a large, sturdy tree, using the ratchet strap. They fashioned a loop in the other end of the cable with two more cable clamps, and hooked the loop over the end of the ratchet strap, which they wrapped tightly around the tree. They were then able to tighten the cable to the perfect tautness. The point on the tree where the zip line stops is slightly higher than the point on the bridge where it starts, so no one can go flying into the tree. At a certain point, you just lose momentum and stop. You’ll have to do your own engineering to make it safe, unless Brother Bear, Nephew Jake, Nephew Jordy and Coach volunteer to come help you. They’re a pretty smart crew! Finally, they drilled a hole in the handlebars and secured them to the pulley with another small piece of cable and the last cable clamp. They attached the pulley to the cable, tied the paracord to the handlebars, and the DIY zip line was done! Of course, there was some trial and error. Nephew Jordy was the first to give it a go, and his feet drug the water nearly the whole way because the cable wan’t taut enough. Simple fix…just ratchet it up until it’s tighter. It took a few runs to get it just right, but then the kids (and a few adults) were zipping into the water over and over again! Also, the handlebars had foam covers on the ends…Niece Liv lost one on one of her runs, but thankfully wasn’t hurt. We removed the other one, and I highly recommend you do the same if you use some old handlebars on your zip line. This DIY zip line has brought more joy to our family and friends than you can imagine. When I was a kid, there was a big tree with a rope attached, and we swung out on the rope into the water a zillion times a summer. That old tree died and fell into the creek years ago, and we knew we had to have something pretty epic to replace it. What’s better than a DIY zip line? I can’t think of a thing! If you decide to try this out, make sure you place it above pretty deep water. Our swimming hole is up to my chin at the furthest drop point, and deeper between there and the bridge. We have to make sure any newbies know where to drop. If you put together your own DIY zip line, do so at your own risk. We tested this and tweaked it and made sure it was completely safe before letting the kids zip off the bridge into the water…take all safety precautions!! Now, go get started on your own DIY zip line! Whoo-HOOO! This post is linked up with Merry Monday, Over the Moon, Wonderful Wednesday, Thursday Favorite Things, #FoodieFriDIY and Sweet Inspirations! That was just delightful to read, though I’m not eager to try it myself, either the building or the zipping! I haven’t done it, and won’t! I can’t even stand on the bridge and watch others do it. You know me and high edges! Lol! I have my own story about that bridge. It’s how I got scar of Africa on my right knee. Ahh, yes…you’re sneak-out (with permission, of course). What a great time for the kids! Making memories is what it is all about! Thank you for sharing at #OverTheMoon! See you next week. Its too much fun for the kids! ? Oh this would be so fun to have! Thanks for linking up to Merry Monday! SPinned! Have a great week! Thank you Kim! It makes for some great summer memories! This looks so stinkin’ cool! You are going to have an awesome summer! It’s not for everyone (ahem..including me), but for those who are brave enough it’s a complete blast! I enjoy watching from the dock! Lol! Thank you for sharing at #ThursdayFavoriteThings! Thanks for being the hostess with the mostest! It would be a dream for all of us having a DIY zip line, and having a river then it would be paradise!! But it would be a problem, who would make dinner? I would be all the time hanging there lol. Thanks for sharing with us at Sweet Inspiration, hope you have a lovely weekend! I don’t have that problem! I’m afraid of heights. I can’t watch from the bridge, but love to watch from the bank!